FLAIR® Equine Nasal Strips were developed as a result of experiences by equine veterinarians. For years they noticed that working horses experienced a collapse of their nasal passages when breathing in during exercise. 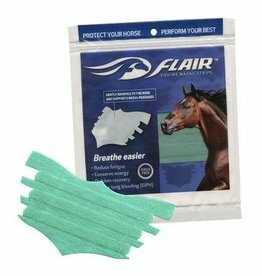 FLAIR® Equine Nasal Strips has been awarded over 15 U.S. and international patents directed to technology embodying the discovery that by supporting the external wall of the nasal passages, nasal strips reduce upper airway resistance and exercise induced pulmonary hemorrhage (EIPH) in horses during exercise.